Beekeeping is a wonderful and satisfying activity for many people all over the world. It is a creative use of space for both conservation and profit purposes. Package bees are an excellent way for beekeepers to get started with a new hive. Installing package bees may also be used to strengthen weak colonies. 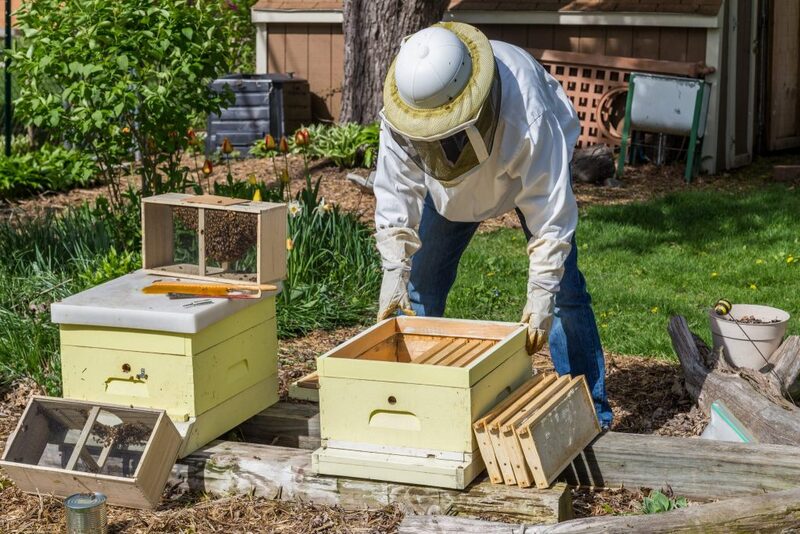 This article will help you to have a smooth time as you will learn how to install package bees into your Langstroth top bar beehive. Furthermore, you will learn how to make sure the bees take to a beehive. As the name implies, package bees come in a package and are used by beekeepers when setting up a new hive. Not every beekeeper is able to go out into the wild and trap a bee swarm, so package bees are convenient for this very purpose. Package bees are usually created by beekeepers who raise bee hives for the purposes of queen rearing and selling bees. These beekeepers split the hive when the colonies get too large and put an entire swarm into a screened box, to be sent off to other beekeepers procuring the package bees. The swarm, of course, includes a queen. This guide covers installing package bees in any type of hive including the popular Langstroth bee hive. A section delves into installing package bees in a top bar hive for beekeepers that use that type of bee hive. Beekeeping with package bees is an easy and affordable way of establishing bee hives for many beekeepers. It is applicable in small and large apiaries alike. Both professional and amateur beekeepers can use package bees with ease. In fact, using package bees to populate a new bee hive is the method with the highest success rate. The common size of packages for bees is 6 x 10 x 16 inches. A wire screen is included on one side of the package box. The queen is held in a smaller queen cage suspended at the top of the package box. Two or more worker bees may be enclosed with the queen to attend to her. In the package bees’ box, pest control measures may be added. These include mite strips to control Varroa mites. Do not open up the package box containing your package bees while at the post office or in any other public places. Get the package box home or to the site of your apiary/beehive quickly and proceed with the installation of the package bees. Bees are bound to get aggressive with intrusions and movement. Opening your package box may let loose an angry bee that will attack you or those around you. In the absence of persons to sting, bees may attack other animals in the vicinity. Transporting a swarm of bees is no easy endeavor. The bees may die in transit. To prevent this, package bees often come with a feeding mechanism included in the screened shipping box. Feeding the package bees with sugar syrup is important in making sure that package bees remain alive in a large enough size of colony. Package bees are sold in package sizes measured by weight. The average package has a weight equivalent of 2-3 pounds. Each pound of bees translates to an average of 3,500 bees. The average and most popular packages of bees thus contain 7,000 to 10,500 bees. Larger packages with a higher number of bees are available from varying sellers of package bees. Depending on where you live, package bees can be sent via post. Notify your local post office about the package bees and the need to keep them in a room below 260 C. Your post office should also notify you once the package arrives. Collect the package bees as soon as you can from the post office. Installing package bees is more successful when done over a period of days. Initially, beekeepers may close up the entrance into the hive. After a number of days, the bees will have settled in and can be allowed to go outside the hive. They will want to clean up and start foraging for supplies. Bees have an adventurous nature that makes them want to fly about. Their hard working instinct may also make them wander around a bit too much. Once you have installed your package bees into a bee hive, the bees may wander out and leave the hive. To prevent this, beekeepers should install package bees late in the afternoon. The bees get adequate time to settle into the hive and then the night is over. The evening cold makes them not want to move out of the hive. By the time it is morning, the bees will have spent a night inside. They are thus more likely to remain inside the bee hive. Alternatively, you may also wet the wings of package bees with sugar syrup. Lightly spray the wings with sugar syrup and the bees will be more focused on cleaning each other up than flying about. 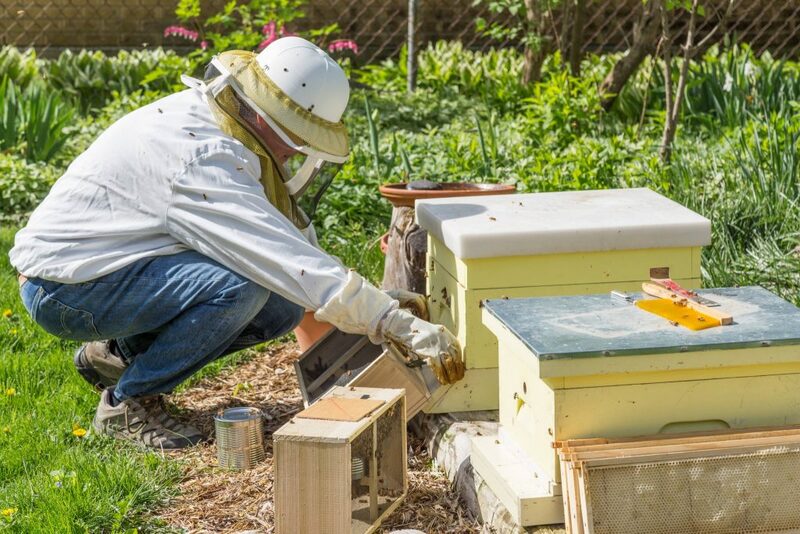 With timing being very important to installing package bees, beekeepers may be curious about the best season of the year to install package bees. Most beekeepers who sell package bees invite you to place your order in January or February as winter approaches its last legs. In early spring, you should get your package bees. Beekeepers using drawn combs should get their bees early in April. Those installing package bees on comb that has foundation are allowed to order their package bees to arrive in late April or the early days of May. Beekeepers in cold climates where winter lasts longer may delay installing package bees by a couple of weeks in order to increase the chances of the bees settling and surviving in the hive once installed. As mentioned, the best time of day to install package bees into a hive is late in the afternoon. Beekeepers installing package bees should first get the queen and place her well in the bee hive. She must not be let loose from the queen box immediately. The other bees should be let loose in the hive but not allowed to leave the hive just yet. After a day cooped up in the hive, most of the bees will have left the package box and begin clustering around the queen bee. Bees usually free their queen from the queen cage on their own. You do not have to poke holes into the queen cage. In a Benton Queen Cage, there is complete sugar candy filling in one of the three holes. You may use a nail to put a hole through the sugar filling. Once the queen is freed of her cage, she will be fed and then start laying eggs in the hive. Drawn comb hastens the start of egg-laying by the queen. If there is no already drawn comb, then the queen must wait for the bees to make some honeycomb. You may leave the queen cage on the frames in your bee hive. You may also hang it in the middle of the frames. Bees will cluster around the queen box and eat their way to the queen. Once freed and laying eggs, the queen does not need to get out of the bee hive. Use a queen excluder in your beehive to keep the queen from laying eggs in unwanted sections of your beehive. Package bees may be installed with use of foundation or without foundation. The need for and use of foundation on frames is up to individual beekeepers. Foundation makes it easier for bees to draw comb on the frames. 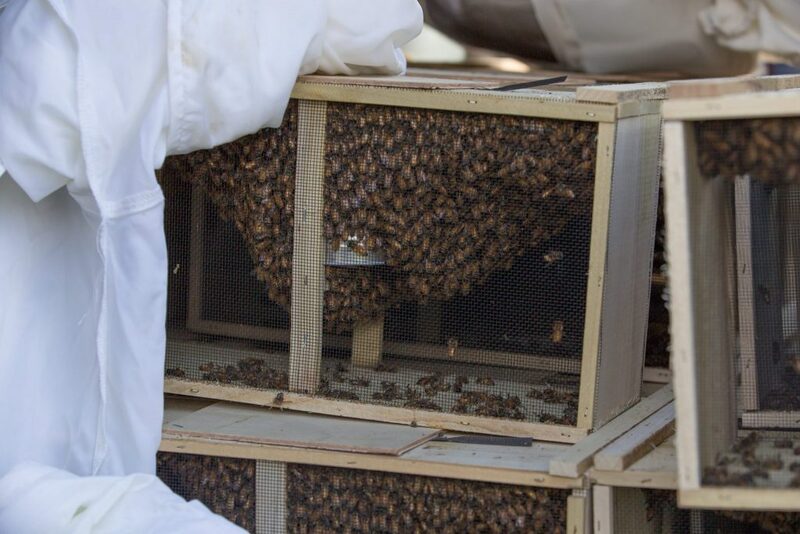 Placing some comb in the bee hive is a bonus move when installing package bees. The bees recycle the old comb into new wax and use it to build honeycomb on your bee hive frames. While placing old comb for your package bees to use in settling into their new hive, make sure to have no dead bees on it. Additionally, you may have a frame or two of pollen and honey for your new package bees. Professional beekeepers who have experience working with bees may add drawn out comb into a bee hive. Your package bees find it easier to start working with already drawn out comb. It saves them time and allows them to settle in the hive with greater ease. Package bees may be installed in a wide variety of bee hive types including the popular Langstroth types. They work well with many beehive types including auto flow beehives. Shaking clustered bees out of their package box is injurious to them. It leads to a high mortality rate in the bees. The use of smoke while installing package bees should be avoided. Most of the bees that may feel aggressive in the package are disoriented anyway. They will not be able to find their way around, and you are most likely wearing protective clothing anyway. It is possible to install package bees without shaking. This requires you to leave the package box open in your bee hive. With the queen removed from the package box, the bees will also get out of the box and cluster around the queen. Allow a day or two for this to take place and then remove the package box from your bee hive. If you are late in removing the box, bees may build comb in and around it. Beekeepers may be in a hurry to transfer package bees into their beehives yet they do not have the luxury of an extra day or two. Tapping the package box lightly to collect the bees in one corner does the trick. A lot of care and precautions must be taken not to injure or kill bees during the transfer from package box to bee hive. In your substitution of shaking bees out of the package box, you do not want to unnecessarily reduce their numbers and lower their ability to settle into the bee hive. Any dead bees in the package box should not be transferred to your bee hive. Remove them as soon as you can. With time, and as the bee colony gets increased capacity to clean the hive, worker bees will remove dead bees from the hive themselves. Installing package bees can be frustrating and a tough undertaking. This is especially true for beginners who do not have much experience or a professional beekeeper to guide them. At the core of using package bees to start new bee hive is a need for the bees to settle in and get to work carrying out hive activities. To enable the package bees you have installed in your bee hive to progress faster, beekeepers may use drawn comb. Drawn comb is comb that is ready for use either in brooding or storage of resources. Such comb can be made of wax by the bees themselves or other material such as plastic. Bees have an easy time with drawn comb. It speeds up hive activities and saves time that would be spent building comb. Using drawn comb in installing package bees carries with it a number of significant risks that beekeepers must be aware of. If they encounter any of the challenges that may arise, beekeepers will thus be in a better position to address and resolve such problems. The biggest risk in using drawn out comb for a fresh bee hive is infection. Drawn comb may have eggs of mites and moths in them. These will hatch and very likely infect the bee hive where you have installed your package bees. You may want to freeze the drawn comb before using it with your package bees. Freezing the comb destroys the eggs of Varroa mites and wax moths. The small red Varroa destructor mites attack both the brood and adult bees. They get their nutrition from bees and spread viruses in the bee colony. Your package bees’ colony will quickly die out in autumn and early spring if it is infected by Varroa mites. Varroa is the most significant parasite of bees with the most felt population and economic impact. It is credited with contributing the biggest losses in global bee population numbers. Wax moths inhabit bee hives and feed on honey comb. They also eat larvae and pupa of bees. Wax moths tunnel through honeycombs to evade worker bees tasked with defense. The moths may at times eat pollen and honey found in a bee hive. Package bees in warmer regions have higher chances of coming under wax moth attack than those in colder climates. Top bar hives are arguably the oldest design of bee hives in beekeeping. They use loose removable bars in place of frames. The classic top bar hive is single-storied. It can be of varying lengths, heights and widths depending on the preference of individual beekeepers. Installing package bees in a top bar hive will require you to remove a few of the top bars. Experienced beekeepers and beginners too should find it easy to introduce and keep package bees in a top bar hive. Once you receive your package bees, be sure to feed them and transfer them to your bee hive as soon as you can. You may leave only a few top bars for the bees to start working with. Top bar hives allow for reduction of the total space of the hive available to bees. You may reduce the space available and increase it gradually as the colony gets better at hive activities and becomes bigger. If your top bar hive is big enough, you may leave the screened package box that holds your package bees in the hive for a day or two. 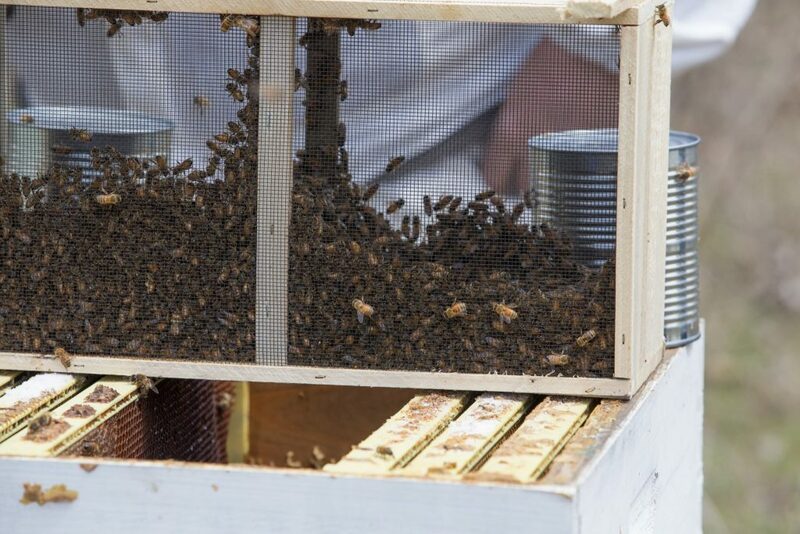 This allows for a smoother transition from the package box into the top bar hive. 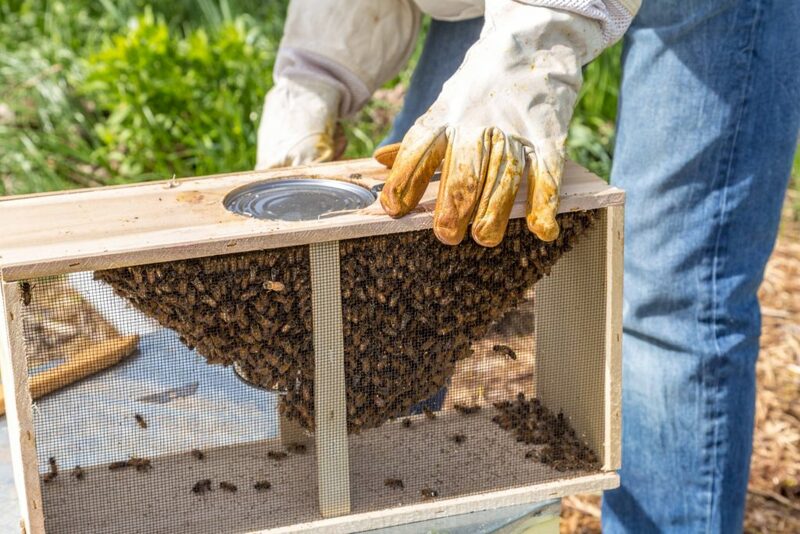 If your package box cannot fit into the top bar hive as is often the case, you have to shake the package bees out of the package box into your top bar hive. Do not forget to feed the newly installed bees in your top bar hive for some time until they can feed themselves adequately. Other safe beekeeping practices including safety and bee hive management apply while installing package bees in a top bar hive. The bees may be aggravated and want to sting. Always wear protective clothing when near or around bees. Sustenance is important in the process of installing package bees. Feeding package bees can be done in two places: the package box and in your bee hive. If your bees are staying in the package box they arrived in overnight or for some time before transferring them to a bee hive, then you should feed them. You should also feed the package bees while they are in the hive. This feeding should go on for some time until the colony of bees can adequately take care of its own food needs. Water forms an integral part of bee food. Sugar syrup is the main feed that bees should be given. In the package box, you are often provided with a feeding cap or other receptacle. Use the resources provided well and follow the instructions of your package bees’ provider. Sugar syrup used to feed bees must be made in the correct water to sugar ratio, which is one part sugar and two parts water. Quiet down the bees just before moving them from the shipping box to your bee hive by feeding them with some sugar syrup. They gorge themselves up and they become better natured. Beginners may remove frames from their bee hive before installing package bees. After the bees settle into the hive, the frames can be brought back. Entrances into the hive where you have installed package bees, should be kept small to preserve heat and prevent robbing. Adding supers or a second hive body is best done after the package bees have settled fully into the bee hive. A weekly check on your hive is important to monitor how well the package bees are settling in. Losses of the package bees of up to 20% have been reported. It is usual for some bees to die, but death in large numbers is injurious to the swarm. Over time, the syrup make up you feed your package bees will change. Beekeepers are advised to know the different mixing ratios for sugar syrup and what it does for the bees at varying times. The mixture that is one part sugar and two parts water (1:2) stimulates the laying of eggs. It is best used when there is enough honey for feeding the brood. A sugar syrup mixture of one part water and one part sugar (1:1) encourages building of comb by package bees. It is best deployed in spring and summer. A third syrup mixture you can use as a beekeeper to feed bees including package bees is one made using two parts sugar and one part water. This syrup has more sugar to increase food storage. It is usually used by experienced and professional beekeepers to prepare their bee colony to survive winter. Use the mixture in fall for the best results in your apiary. You may use sugar candy to feed your package bees. Different beekeepers use varying sugar candy recipes. Some involve cooking the sugar while others do not. You may also explore dry sugar feeding. It is important to take care not to introduce excessive moisture into your bee hive in the process of feeding your package bees. Once your package bees are settled in, you will continue feeding them for some period of time. You may use an entrance feeder to encourage your bees to venture out and forage. An entrance feeder reduces moisture buildup in the bee hive. It is well suited for Langstroth and top bar hives. Package boxes usually have a feed can in them. It often contains sugar syrup to feed the bees. 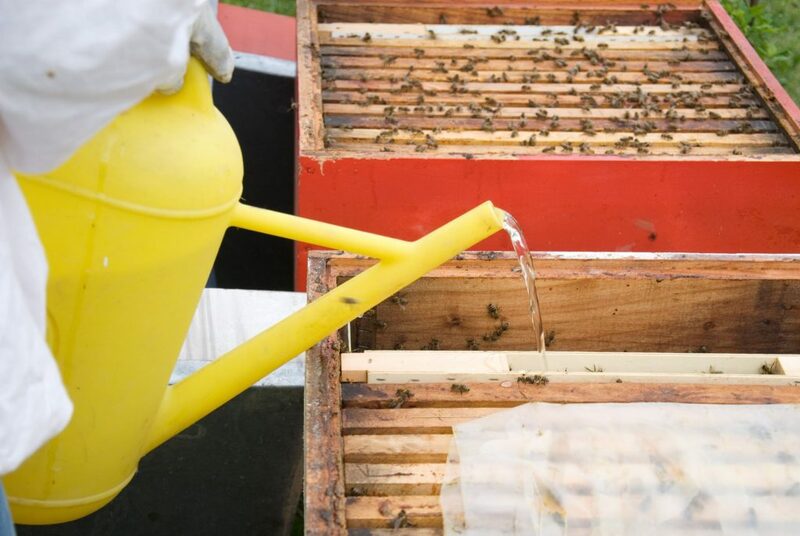 If your package bees have been for some time without water – usually due to a long journey, they may not need the syrup as much as they need to quench their thirst. Beekeepers should thus provide water for their package bees upon reception. If the bees have only been moved a short distance taking up little time, you may skip providing water for them immediately upon arrival. Package Bees that have been moved with due care and adherence to bee transport precautions with regulation of temperature and feeding along the way, are more resilient and need less immediate care upon arrival at their destination. Cleanliness is important for bee colonies. Remove any left-over feeding syrup from near the bee hive. Additionally, make sure that the syrup does not ferment. Alongside sugar syrup for feeding your package bees, make sure you have availed water for your bees to drink. Beekeepers may provide old comb and beeswax as part of the feed they give their package bees. Old comb and beeswax will be eaten up by the package bees and reused in the beehive. You may place the old comb someplace near the bee hive where your package bees can easily reach it. Getting package bees is best done in person. That way, the beekeeper gets to ensure the bees are well taken care of in transit. If weather conditions are not good on the day you get your bees, they may be kept in a dark room and provided with sugar syrup. Some sellers of package bees may include sugar syrup feeding equipment in their screened shipping box along with the package bees. Bees die quickly when exposed too much to the heat of the sun. Do not leave your package bees outdoors in the sun or in a very warm place. Make sure to inspect the package once you receive it. You should be alarmed by an unusually high number of dead bees in the package. Check for the presence of harmful Varroa destructor mites and other pests of honey bees. The queen bee of package bees that you receive should be alive and vigorous. If she is not, contact your package bees’ supplier and see about getting a replacement queen bee. While bees in an established colony can breed a new queen easily, package bees may not be able to do it even if they are successfully installed into a bee hive. Timing your package bees’ installation is very important. If you install them too early, they do not quickly get to work in the bee hive. Late installation of package bees gives them less time to build up their honey reserves before adverse weather sets in. The best time to install bees in any bee hive is when bees are active in the environment. Usually, this is during the time most plants are flowering. Your package bees are able to collect enough pollen, nectar and other resources needed for a healthy thriving bee hive. Personal protection for beekeepers is important while working with bees. Beekeepers should wear protective gear while working around bees. During transfer of the package bees and subsequent inspections of how well the bees are taking to the hive, be sure to be in adequately protective gear. There are many sellers of such gear with varying designs and sizes that suit individual beekeepers’ choices. Installing package bees is easy for both beginners and amateurs. Use this how to guide to easily and successfully start your own beehive. Make sure to follow the process of installing package bees well. You should also not forget to let out the queen out of her cage after the swarm settles into your bee hive. She must start laying eggs in any ready cells as soon as possible. Have you ever installed package bees before? Leave a comment below and let us know what your experience was like.